Meghan Herp is a black belt in Krav Maga, which she has been training in for more than 10 years. She has also trained in Muay Thai and boxing at Core. Meghan received a bachelor’s degree in exercise science and a master’s degree in exercise physiology with a minor in strength and conditioning (from the University of Louisville). She was formerly the Head Sports Performance Coach at HOOPS Acceleration Elite. 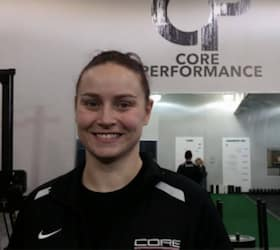 Meghan has been an instructor for 6 years and currently teaches Core’s CoreFit and Krav Maga (intermediate) classes.